There are two categories of heel pain: pain on the bottom (plantar) and pain on the back of the heel bone (calcaneus). The most common cause pain on the bottom of the heel is plantar fasciitis or better known as heel spur syndrome. Another common cause is nerve entrapment (~70% of patients have both plantar fasciitis and nerve entrapment) and less commonly, stress fracture, arthritis, tendonitis, a cyst or a combination of these. Pain on the back of the heel most often involves the insertion of the Achilles tendon into the bone. Due to the multi-factorial nature of heel pain, the earlier a diagnosis is made, the better the outcome. 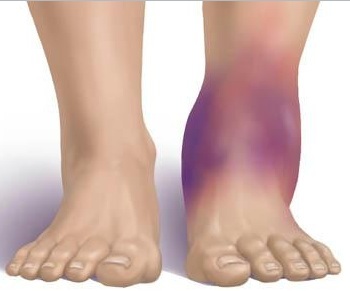 Depending on the condition, the cause of heel pain is diagnosed using a number of tests, including medical history, physical examination, including examination of joints and muscles of the foot and leg, X-rays. Rest until there is no more pain. This is the most important element of treatment as continuing to walk or run on the injured foot will not allow the injury to heal. Wear soft trainers with lots of cushioning or pad the heel of shoes with shock absorbing insoles or heel pads. These should be worn in both shoes, even if only one heel is bruised. Wearing a raise in only one shoe causes a leg length difference which can cause other problems. Replace running shoes if they are old. A running shoe is designed to last for around 400 miles of running. After this the mid soles are weakened through use.